The rules of High Streak should be familiar to most blackjack players, since they are basically the standard European Blackjack rules. First, players can count on the dealer to stand on all 17s. Splitting is allowed, players cannot re-split any hand. Aces may be split, but only take one more card, and split aces that receive a 10 count as 21, not blackjack. Players can double down on 8, 10, or 11, but cannot double down after a split or a blackjack hand. The only change to the regular European Blackjack rules involves the game’s special High Streak side bet. A max of 200 credits can be bet at once. If the hand is won, the bet moves up the ladder to the next position, and a new side bet may be placed. Each consecutive win increases the payout odds of the side bet, bringing in ever higher wins for the player. It is important to note that a new side bet may be placed after each winning hand, so if a player makes it to the 5th Streak Win level, it is possible to be paid out on all Streak Win levels at once! Also, the original side bet is returned if the 5th Streak is won. As with all of Microgamings card games, the graphics in High Streak European Blackjack are simply excellent. The table is perfectly designed, with lots of useful information placed along the edges, out of the way from the playing area but still easily accessible. The card graphics are bold and easy to read, and the chips use a unique floating effect to make it unmistakable how much is being bet on each hand. The design and overall look of the game simply couldn’t be any better. The best part about this game is that the side bet pays out with each hand a player wins, so as long as the player keeps placing a small chip in the High Streak side bet area of the table, every hand won will bring in a little extra money. It is easy to get to the 3rd or even 4th level, and a little trickier to make it all the way to the 5th, but the payouts increase exponentially as the wins pile up, making this side bet worth spending money on. There are a lot of games on the internet with special side bets, but many of them are really not worth spending the extra money on. 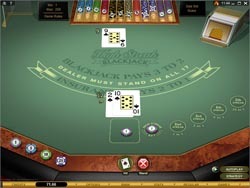 The side bet in this High Streak European Blackjack game from Microgaming is different. It only pays when the hand is won, so it’s an all-or-nothing wager, but with payouts up to 10:1, there is a lot to be won. Of all the side bet games out there, this is one of the easiest to win with.